Oncolytic viruses are novel anticancer agents, currently under investigation in Phase I–III clinical trials. Until recently, most studies have focused on the direct antitumor properties of these viruses, although there is now an increasing body of evidence that the host immune response may be critical to the efficacy of oncolytic virotherapy. This may be mediated via innate immune effectors, adaptive antiviral immune responses eliminating infected cells or adaptive antitumor immune responses. This report summarizes preclinical and clinical evidence for the importance of immune interactions, which may be finely balanced between viral and tumor elimination. On this basis, oncolytic viruses represent a promising novel immunotherapy strategy, which may be optimally combined with existing therapeutic modalities. The anticancer activity of viruses has been reported throughout the 20th century. Developments in virology, genetic manipulation and molecular biology have led to a surge of research investigating viruses with oncolytic or antitumor properties over the last 15 years. Several oncolytic viruses are currently in Phase I–III clinical trials . Until recently, despite the multitude of studies investigating direct viral effects upon cancer cells, relatively little attention had been paid to the interaction between oncolytic viruses and the immune system. We discuss the evidence supporting the view that the host immune response is critical to the efficacy of oncolytic virotherapy. The potential of oncolytic viruses to break immunological tumor tolerance, generating antitumor immunity, represents a novel avenue of immunotherapy. Oncolytic viruses are self-replicating, tumor selective and directly lyze cancer cells . They may be tumor selective in wild-type or attenuated forms or may be engineered to provide tumor selectivity. Naturally occurring oncolytic viruses include the double-stranded RNA reovirus and single-stranded RNA Newcastle disease virus (NDV) and vesicular stomatitis virus (VSV). By contrast, human DNA viruses, including adenoviruses, vaccinia and herpes simplex viruses (HSV) have been genetically modified in a variety of ways to provide tumor selectivity. A diverse range of mechanisms provide tumor specificity, including inactivation of antiviral defences, such as type I IFN responses in many cancer cells, viral deletions permitting replication only in tumor cells that can substitute for viral defects, tumor-selective uptake via upregulated or mutated receptors, and targeting to tumor promoters. In the majority of clinical trials performed so far, oncolytic viruses have been administered via intratumoral injection. A smaller number of studies have examined regional or intravenous delivery. Clinical experience has demonstrated a favorable toxicity and safety profile and a number of tumor responses, although overall antitumor efficacy has been limited . For example, ONYX-015, a modified adenovirus, has been used in clinical trials with response rates of 0–14% following intratumoral administration . In view of the short history of oncolytic virotherapy, along with recent scientific advances in methods of viral delivery and enhancing antitumor potency, these low levels of single-agent clinical responses provide encouragement for the future. An increasingly powerful body of evidence supports the ability of the immune system to modify the immunogenicity and behavior of tumors . A host of tumor-associated antigens (TAA) have been characterized  and in a single tumor, tumor-infiltrating lymphocytes directed towards multiple TAAs can be identified . Despite these antigenic differences, the antitumor immune response is commonly ineffectual. Tumors can subvert antitumor immunity, generating an immunosuppressive tumor microenvironment by a multitude of mechanisms. These include the induction of Treg cells, secretion of soluble immunosuppressive mediators including nitric oxide, IL-10 and TGF-β and recruitment of myeloid suppressor cells . Matzinger’s ‘danger’ hypothesis proposes that the prime role of the immune system is to respond to cellular or tissue distress as opposed to nonself per se . Several danger signals have been identified, including RNA, DNA, IFN-α, heat-shock proteins, uric acid and hyaluron, providing a mechanistic basis for this hypothesis . On this basis, tumor-associated danger signals are critical to the generation of effective antitumor immunity. In addition to their ability to disrupt immune responses, tumors commonly lack such signals and successful tumor immunotherapy will probably to depend upon their provision. Oncolytic virotherapy represents a potent approach to cancer immunotherapy, combining the enhanced release of TAA via tumor cell death, in the context of danger signals (FIGURE 1). The role of the innate immune response to cancer is double-edged. Chronic inflammatory changes can promote tumor progression via proliferative and proangiogenic signals , while by contrast, the infiltration of activated innate inflammatory cells can mediate tumor regression in vivo . Manipulation of the immune environment within a tumor is a potentially critical strategy towards successful tumor immunotherapy . Oncolytic viruses represent prime candidates to enhance the immunogenicity of the tumor microenvironment. As detailed below, oncolytic virotherapy may be immunomodulatory via tumor cell death, production of endogenous danger signals, the release of tumor-derived cytokines and direct effects upon cells of the innate immune system. Evidence from preclinical models suggests that an early influx of immune cells, including macrophages and natural killer (NK) cells, occurs in response to tumor viral therapy [12–14]. These changes within the tumor hold the potential to alter the pre-existing immunosuppressive microenvironment, in favor of the generation of therapeutic immune responses. Dendritic cells (DC), the prime antigen-presenting cells and a component of the innate immune response are critical for the subsequent generation of antigen-specific or adaptive immune responses. However, as discussed later, the outcome of the innate response is finely balanced between promotion of tumor clearance and viral clearance limiting efficacy. Virally induced cell death would be expected to enhance the availability of TAA for uptake by DC. Indeed, viral infection of tumors has been reported to enhance the phagocytosis of tumor-derived material [15,16]. The relationship between the mode of cell death and tumor immunogenicity has, however, been controversial; the immunogenicity of tumors has been reported not to be affected by whether tumor cells are alive, apoptotic or necrotic . Even if the mode of cell death is not an immunogenic determinant, the release of intrinsic cell factors, including heat-shock protein , uric acid  and bradykinin , can be identified as danger signals by DC. Oncolytic viral infection may mediate production of these factors. For example, tumor cell infection by a modified oncolytic adenovirus increases intracellular uric acid levels, activating DC . An array of cytokines provides costimulation for T-cell responses, while by contrast, tumor-derived cytokines, including TGF-β and IL-10, have immunosuppressive properties. In addition, the tumor-derived proinflammatory cytokines VEGF, TNF-α and several chemokines have been linked to promotion of tumor growth . Oncolytic viral infection is likely to alter the balance of cytokines produced and the nature of the subsequent immune response. We have investigated the release of cytokines following infection of melanoma cells with reovirus, a naturally occurring double-stranded RNA virus currently in clinical trials . Reovirus was found to induce secretion of IL-8, RANTES and MIP-1α/β, which play a role in the recruitment of DC, neutrophils and monocytes , and of IL-6, which can inhibit the immunosuppressive function of Treg cells . Reovirus additionally reduced tumor secretion of the immunosuppressive cytokine IL-10. The immunogenic property of tumor-conditioned media from reovirus-infected tumor cells (filtered to remove viral particles) was confirmed by their ability to activate DC. The immune system is adept at pathogen recognition and a host of receptors specific for pathogen-associated molecular patterns, including the toll-like receptors (TLR), have been identified . Innate viral recognition can center around viral nucleic acids or viral proteins . DC play a critical role in the early innate immune responses, reciprocally interacting with other innate immune cells, including NK cells . In this context, oncolytic viruses can influence the nature of the innate tumor response. Reovirus-infected DC, for example, enhance NK cytotoxicity towards tumor cells . The effect of viruses upon DC is virus specific: measles and a vaccinia virus strain impair DC phenotype and function [28,29], an oncolytic adenovirus has a neutral effect , while reovirus is directly stimulatory to DC . Although the immunomodulatory effects of oncolytic viruses have been investigated to a limited degree, it follows that the immune consequences of therapy with different viruses will vary widely. In addition, the genetic modification of viruses to confer oncolytic specificity may involve interference with virulence genes whose function is to modify the antiviral immune response, including type I interferon response genes [2,31]; alteration of such immunomodulatory genes will alter the consequences of the immune interactions of these modified viruses. The innate immune response is thought to provide an important link to the generation of adaptive immune responses. DC are key to this link, taking up TAA, integrating danger signals and presenting antigen in an appropriate costimulatory context to the adaptive arm of the immune system. An adaptive antitumor immune response requires activation of cytotoxic CD8 T cells by DC presenting tumor antigen on MHC class I molecules. The presentation of exogenous antigen in a MHC class I context is termed ‘cross-presentation’. Critically, virally infected cells have been shown to be superior at delivering nonviral antigen for cross-presentation and cross-priming adaptive immune responses in vivo . Intriguingly, recent work has defined a role for TLR-4 receptor ligands (bacterially derived lipopolysaccharide) in enhancing cross-presentation ; a similar effect of viral as opposed to bacterial TLR ligands has yet to be explored. Inflammatory stimuli have additionally been shown to enhance antigen processing and the generation of MHC class II complexes, required for CD4+ T-cell help in adaptive immune responses [34,35]; such inflammatory stimuli could be provided by viral tumor infection. Oncolytic virotherapy may therefore enhance immune priming via multiple effects upon DC. There is an emerging body of data from murine and human preclinical research supporting the concept that the efficacy of oncolytic virotherapy is at least partially immune mediated and that antitumor immunity can be generated. Overall, the antiviral humoral and cellular immune responses may have contrasting consequences. Methods of enhancing viral delivery to tumors or immunomodulation provide an opportunity to alter this balance in favor of therapeutic benefit. Although preclinical studies have provided support for the concept that the efficacy of oncolytic virotherapy may be dependent upon the host immune response, there are limited data on the immune response following virotherapy from early clinical trials. Studies of intratumoral administration have provided direct evidence of a cellular immunological response. In a Phase I trial of a second-generation oncolytic HSV expressing GM–CSF injected into subcutaneous metastases from a variety of tumor types, post-treatment biopsies revealed an extensive immune cell infiltrate . Additionally, suggestive of an immune-mediated antitumor effect, was the observation of inflammation in uninjected tumor deposits in four of 30 treated patients. Similarly, in a study of intratumoral administration of a recombinant vaccinia–GM–CSF virus in patients with melanoma deposits, treated lesions were shown to have a dense immune cell infiltrate. The generation of antitumor immunity was implied by the regression of noninjected regional dermal metastases in association with an immune infiltrate in four of seven treated patients . A Phase I study of injection of JX-594, a targeted poxvirus armed with GM–CSF, into primary and metastatic liver tumors has recently been reported with encouraging evidence of activity, with a partial response in three and stable disease in six of ten evaluable patients by Response Evaluation Criteria in Solid Tumors (RECIST) . Consistent with a possible antitumor immune response was the durability of tumor responses. Notably, there was evidence of functional response in noninjected tumors in three of seven evaluable patients by Choi criteria for reduction in Hounsfield units (n = 2) and by reduced 18F-fluorodeoxyglucose (18FDG)-PET signal (n = 1). There was evidence of viral dissemination to noninjected tumor tissue. The responses in injected and noninjected tumor tissue could therefore have been mediated by direct viral oncolysis, antiviral immune responses towards virally infected cells or antitumor immune responses established in the injected lesions. Oncolytic viruses have been combined with tumor vaccines in an attempt to exploit viral danger signals. Vaccinia virus–melanoma cell lysate vaccines were used in an adjuvant Phase III study of 700 patients following melanoma resection, with no improvement in recurrence or overall survival . A series of clinical studies has been performed by Schirrmacher et al. using a live autologous tumor vaccine infected by NDV irradiated to render tumor cells nonviable . A significant proportion of patients developed antitumor immune responses as assessed by a delayed-type hypersensitivity response to skin prick tests. Phase II studies have been performed in glioblastoma multiforme, melanoma, breast and colorectal cancer with improvements in overall survival by 20–36% at 2–5-year follow-up compared with historical controls. These studies suggest that oncolytic viruses can break immunological tumor tolerance, although Phase III studies are needed to confirm these findings. Combination therapy may be the optimal context in which to exploit the immunotherapeutic potential of oncolytic viruses. A rationale exists for combination with existing immunotherapy strategies, along with conventional therapy. The use of cell carriers to chaperone viral particles to the tumor is a promising innovation . Cells of the immune system have proven particularly adept, including cytokine-activated killer cells  and T lymphocytes . Adoptive cellular therapy has met with some clinical success, but has been limited by the trafficking to and survival of T cells in the tumor microenvironment . In a mouse model, the combination of oncolytic virus delivery with antigen-specific adoptive T-cell therapy has been shown to improve upon either treatment modality alone . Although yet to be tested in clinical trials, these findings are of significant translational potential. Immunotherapy approaches may be logically combined with virotherapy to enhance antitumor responses. The host immune response will probably be critical to the efficacy of oncolytic virotherapy, although it is a fine balance between rapid viral elimination and innate and adaptive responses, which may mediate tumor regression. The rational design of combination therapy, modulating the immunological outcome, may hold the key to fulfilling the potential of these novel agents. Clinical trials should be designed to include specific assessment of immune responses to both tumor and viral antigens, and recognize the immunotherapeutic potential of virotherapy in terms of clinical end points and patient selection. Oncolytic viruses (OV) selectively replicate and kill cancer cells and spread within the tumor, while not harming normal tissue. In addition to this direct oncolytic activity, OVs are also very effective at inducing immune responses to themselves and to the infected tumor cells. OVs encompass a broad diversity of DNA and RNA viruses that are naturally cancer selective or can be genetically engineered. OVs provide a diverse platform for immunotherapy; they act as in situ vaccines and can be armed with immunomodulatory transgenes or combined with other immunotherapies. However, the interactions of OVs with the immune system may affect therapeutic outcomes in opposing fashions: negatively by limiting virus replication and/or spread, or positively by inducing antitumor immune responses. Many aspects of the OV–tumor/host interaction are important in delineating the effectiveness of therapy: (i) innate immune responses and the degree of inflammation induced; (ii) types of virus-induced cell death; (iii) inherent tumor physiology, such as infiltrating and resident immune cells, vascularity/hypoxia, lymphatics, and stromal architecture; and (iv) tumor cell phenotype, including alterations in IFN signaling, oncogenic pathways, cell surface immune markers [MHC, costimulatory, and natural killer (NK) receptors], and the expression of immunosuppressive factors. Recent clinical trials with a variety of OVs, especially those expressing granulocyte macrophage colony-stimulating factor (GM-CSF), have demonstrated efficacy and induction of antitumor immune responses in the absence of significant toxicity. Manipulating the balance between antivirus and antitumor responses, often involving overlapping immune pathways, will be critical to the clinical success of OVs. Cancer Immunol Res; 2(4); 295–300. ©2014 AACR. Oncolytic virus (OV) therapy is based on selective replication of viruses in cancer cells and their subsequent spread within a tumor without causing damage to normal tissue (1, 2). It represents a unique class of cancer therapeutics with distinct mechanisms of action. The activity of OVs is very much a reflection of the underlying biology of the viruses from which they are derived and the host–virus interactions that have evolved in the battle between pathogenesis and immunity. This provides a diverse set of activities that can be harnessed and manipulated. Typically, OVs fall into two classes: (i) viruses that naturally replicate preferentially in cancer cells and are nonpathogenic in humans often due to elevated sensitivity to innate antiviral signaling or dependence on oncogenic signaling pathways. These include autonomous parvoviruses, myxoma virus (MYXV; poxvirus), Newcastle disease virus (NDV; paramyxovirus), reovirus, and Seneca valley virus (SVV; picornavirus); and (ii) viruses that are genetically manipulated for use as vaccine vectors, including measles virus (MV; paramyxovirus), poliovirus (PV; picornavirus), and vaccinia virus (VV; poxvirus), and/or those genetically engineered with mutations/deletions in genes required for replication in normal but not in cancer cells including adenovirus (Ad), herpes simplex virus (HSV), VV, and vesicular stomatitis virus (VSV; rhabdovirus; refs. 1,3). Genetic engineering has facilitated the rapid expansion of OVs in the past two decades, enabling a broad range of potentially pathogenic viruses to be manipulated for safety and targeting (3). Many of the hallmarks of cancer described by Hanahan and Weinberg (4) provide a permissive environment for OVs; they include sustained proliferation, resisting cell death, evading growth suppressors, genome instability, DNA damage stress, and avoiding immune destruction. In addition, insertion of foreign sequences can endow further selectivity for cancer cells and safety, as well as altering virus tropism through targeting of translation with internal ribosome entry sites (IRES) or microRNAs (PV and VSV), transcription with cell-specific promoter/enhancers (Ad, HSV), or transduction with altered virus receptors (HSV, Ad, MV, and VSV; refs.1, 3). These strategies are also being used to target replication-deficient viral vectors for gene therapy applications in cancer immunotherapy. OVs have many features that make them advantageous and distinct from current therapeutic modalities: (i) there is a low probability for the generation of resistance (not seen so far), as OVs often target multiple oncogenic pathways and use multiple means for cytotoxicity; (ii) they replicate in a tumor-selective fashion and are relatively nonpathogenic and, in fact, only minimal systemic toxicity has been detected; (iii) virus dose in the tumor increases with time due to in situ virus amplification, as opposed to classical drug pharmacokinetics that decrease with time; and (iv) safety features can be built in, such as drug and immune sensitivity. These features should result in a very high therapeutic index. An important issue for OV therapy is delivery. Although systemic intravenous administration is simpler than intratumoral injection and can target multiple tumors, it has drawbacks, including nonimmune human serum, anti-OV antibodies that preexist for human viruses or can be induced by multiple administrations, lack of extravasation into tumors, and sequestration in the liver (1). Cell carriers [i.e., mesenchymal stromal cells, myeloid-derived suppressor cells (MDSC), neural stem cells, T cells, cytokine-induced killer cells, or irradiated tumor cells] can shield virus from neutralization and facilitate virus delivery to the tumor (5). The effectiveness will vary depending upon the cell phenotype, permissiveness to virus infection, tumor-homing ability, and transfer of infectious virus to tumor cells. To block virus neutralization and extend vascular circulation, viruses can also be coated in nanoparticles (i.e., PEGylation; ref. 1). Virus infection and pathogenicity have been major drivers in the evolution of the human immune system, and vaccination against viruses is the quintessential exploitation of adaptive immunity. A major goal of OV-mediated immunotherapy is to activate and redirect functional innate and adaptive immune responses toward the tumor. Interactions between innate and adaptive immune cells and signaling factors (i.e., cytokines and chemokines), often involved in virus infections, play a large role in antitumor immunity or lack thereof, as well as successful immunotherapies (Fig. 1). Virus infection induces an inflammatory response leading to adaptive antivirus immunity. Thus, the immune system was seen initially as a negative factor in OV therapy for limiting virus infection/delivery because of preexisting or therapy-induced immunity, virus replication because of innate antiviral responses, and virus spread because of the infiltration of innate immune cells (6). In addition, most early studies were performed in human xenograft tumor models in immunodeficient mice lacking adaptive immune responses because some viruses were species selective or replicated better in human cells, and because there was availability of a broad diversity of human cancer cell lines. With the use of syngeneic tumor models in immunocompetent mice, it became clear that the consequences of the immune system were complex, but that the induction of antitumor immunity was feasible and efficacious (6). In particular, many OVs act asin situ vaccines, inducing robust, long lasting, and specific adaptive antitumor responses, often CD8+ T cell–mediated (7, 8). Interestingly, adaptive antiviral immunity can enhance antitumor immunity for HSV, but not for VSV (8, 9). Cartoon of OV-mediated effects in tumor. First phase, OV delivered intratumorally or systemically, infects tumor cells (can be blocked by humoral defense systems; antibodies). After infection, OV replicates (can be blocked by innate responses; i.e., IFN-α/β), kills cells often by ICD, and spreads throughout the tumor (can be blocked by innate immune cells, i.e., NK cells and macrophages), eliciting an inflammatory response. When an armed OV is used, the immunomodulatory transgene is expressed (transgene product). Second phase, ICD and inflammation recruit DCs to the tumor, where they take up TAAs and induce an adaptive immune response (T and B cells), which targets the tumor (can be blocked by Tregs and MDSCs). Innate cells such as NK cells also have antitumor activities. Antitumor immune responses can be further enhanced by transgene products. CPA, cyclophosphamide. The inflammatory cascade and immunogenic cell death (ICD) induced by OV infection of tumors makes OVs particularly powerful inducers of antitumor immunity (8, 10). Among the many different types of cell death, some are immunogenic and characterized by the release of danger-associated molecular patterns (DAMP), such as calreticulin, high-mobility group protein B1 (HMGB1), and ATP, along with tumor-associated antigens (TAA; ref. 10). Multiple forms of ICD have been observed after OV (Ad, VV, HSV, MV, and coxsackievirus) infection of cancer cells, and there is a suggestion that ICD occurs in patients after treatment with oncolytic Ad and temozolomide (11). However, much remains to be learned about the mechanisms of OV-mediated cell death and how it can be exploited to enhance immunogenicity. Inflammation, typically chronic, can also promote tumorigenesis and inhibit T-cell antitumor activity (12). Restraining antiviral immune responses and minimizing pathology, while promoting antitumor immune responses, is a complex and poorly understood balancing act that will dictate OV therapy outcomes. In some cases, where minimal OV replication occurs in mouse tumors (i.e., HSV) or no replication is required (i.e., reovirus; ref. 13), antitumor efficacy is principally due to OV-induced immune responses. Understanding, harnessing, modulating, and/or enhancing OV-mediated immune responses for effective antitumor immunity are major areas in current research that intersect with other immunotherapeutic strategies. Many viruses express immune evasion genes that enable them to establish infections and spread within their host (14). Mutations in these genes (i.e., HSV Us11, VV E3L, MYXV M156R, Ad VAI, and reovirus σ2/σ3, inhibitors of PKR; HSV ICP0, VV N2, NDV V, and MV V, inhibitors of IRF3; HSV ICP0, MYXV M13L, MV V, PV 3C, and VSV M, inhibitors of NF-κB; VV B8R and MYXV MT-7, inhibitors of IFN-γ; HSV ICP47 and AdE3-19K, inhibitors of MHC class I presentation; MV gp, inhibitor of T cells; and MYXV M128L and MV H, inhibitors of CD46) are likely to enhance the induction of immunity and possibly cross-presentation of TAAs. Such mutations should improve the safety of OVs by making them more visible to the immune system, as well as increasing antitumor immune responses. Conversely, they may diminish virus replication and spread. An additional problem not as easily addressed is OV infection of immune cells, especially dendritic cells (DC), that interferes with their function (15, 16). Although adaptive immunity seems to provide and, in fact, represent even the major mode of anticancer action for OVs, it is also evident that an initial host response against an administered OV could destroy it along with the infected cells before the OV has a chance to replicate and induce cytotoxicity of a magnitude that is sufficient to set up an effective vaccination response (17). Location and site of OV administration is an important determinant of the characteristics of these initial host responses against the OV. For instance, intravenous or intra-arterial administration of OVs, such as recombinant HSV1, leads to its rapid recognition and elimination by the circulating complement and antibodies of the humoral defense system (18, 19). This has also been shown for VV (20), NDV (21), MV (22), and Ad (23, 24). Intratumoral administration can also lead to complement- and antibody-mediated destruction of the OV. In addition, intracellular and microenvironmental antiviral defense responses in infected tumor cells can also greatly limit the magnitude of OV replication (25–31). Finally, innate immune cells can rapidly respond to an administered OV, further limiting its survival and that of OV-infected tumor cells (32–35). In all these models, circumvention of such responses using pharmacologic agents, such as histone deacetylase (HDAC) inhibitors or immunomodulating drugs, or genes that block antiviral defense mechanisms, has led to improved OV replication and tumor cytotoxicity (reviewed in ref. 36). When pharmacologic agents are used, the interference of antiviral responses can be applied in a transient fashion usually right before or at the time of OV administration. This should lead to an initial burst of OV replication leading to tumor cell lysis. As the pharmacologic effects against host innate immunity wane, a large debris field of OVs and tumor antigens could be more promptly recognized by the antiviral host response, leading to a secondary long-term vaccination effect responsible for effective tumor immunity (Fig. 1). However, quantification of responses to OV therapy is a sorely needed area of investigation. For instance, the number of OV-replicative rounds, the tumor cell-OV burst size, the number of OV-replicative tumor foci, and the temporal kinetics of innate response suppression that are needed for an efficient lytic and vaccination effect are still undetermined. In fact, current applications of innate immunity modulation with OV administration remain to be determined in an empirical manner. Many OVs can accommodate gene insertions and thus can be “armed” with therapeutic transgenes, combining local gene delivery with oncolytic activity (42). Local expression in the tumor obviates toxicity arising from systemic administration of potent immune modulators. GM-CSF, based on its effects in cytokine-transduced cancer cell vaccines (i.e., clinically approved Sipuleucel-T), has been incorporated into a number of OVs [HSV T-Vec, VV JX-594, Ad Ad5/3-D24-GMCSF (43), and CG0070 (44)] that have entered clinical trials (8). GM-CSF–expressing OVs demonstrated only moderate activity in preclinical studies (45, 46), while JX-594 was not compared with a VV lacking GM-CSF (47). Other therapeutic transgenes include interleukin (IL)-2 (NDV, HSV, and parvovirus), IL-12 (Ad and HSV), IL-15 (VSV), IL-18 (HSV), IFN-α/β (Ad, VSV, and VV), soluble CD80 (Ad and HSV), 4-1BB (VV), CD40L (Ad, and no effect with VSV), Flt3L (Ad and HSV), CCL3 (Ad), CCL5 (Ad and VV), and combinations thereof (2). In addition to transgenes that enhance adaptive immune responses, cytokines/chemokines directed at the tumor microenvironment can alter the immune cell balance toward productive therapeutic immunity (Fig. 1). IL-12, a potent antitumor cytokine with antiangiogenic activities, when expressed from oncolytic HSV, reduced neovasculature and tumor regulatory T cells (Treg) and induced T cell–mediated immunity in an immunocompetent cancer stem cell model (48). Expression of a CXCR4 antagonist from oncolytic VV reduced tumor vasculature and accumulation of bone marrow–derived epithelial and myeloid cells and induced antitumor humoral responses (49). Like many cancer vaccine strategies, OVs expressing TAAs can be used to induce tumor-selective adaptive immune responses. The combination of TAA expression in the tumor and OV-mediated cell killing induces enhanced T-cell migration and activation compared with OV-infected tumor cells expressing the TAA (50). This can be coupled to a prime (replication-deficient Ad or oncolytic Semliki Forest virus expressing a TAA)–boost (oncolytic VSV or VV expressing the same TAA) vaccine strategy, in which the boosted secondary response to the tumor dominates the primary anti-OV response (6, 8). To expand the antigenic repertoire, cDNA libraries from normal tissue (e.g., prostate for prostate tumors) or recurrent tumors have been inserted into VSV, and induced therapeutic immunity (51). Further enhancement was obtained by expressing xenogeneic TAAs (51, 52). The ability of oncolytic VSV expressing TAAs to induce IL-17 in the context of tumor immunity has been exploited to screen tumor cDNA libraries for individual TAAs and optimal TAA combinations, limiting potentially inappropriate responses of whole-cell or cDNA vaccines (53). Developing a similar strategy in a human setting would be a major advance. A number of immunomodulatory agents have been examined to restrain antiviral immune responses and promote OV replication and spread. Cyclophosphamide can increase OV replication and inhibit tumor growth by suppressing innate immune cell (34) and antibody responses (54), depleting Tregs, and enhancing the antitumor activity of CTLs (Fig. 1; ref.8). A challenge is to identify immunosuppressive strategies that can blunt acute innate cells from blocking virus replication and spread, while permitting sufficient inflammation and cross-priming for robust antitumor immunity. Conversely, it will be of interest to combine OV with chemotherapies that induce ICD (e.g., cyclophosphamide, oxaloplatin, or anthracyclines such as doxorubicin and mitoxantrone), increase tumor cell antigenicity (e.g., gemcitabine, cisplatin, or etoposide) or susceptibility to immune cells (e.g., HDAC inhibitors, paclitaxel, or doxorubicin), or suppress MDSCs (e.g., gemcitabine and paclitaxel) and Tregs (e.g., cyclophosphamide or sunitinib; ref. 55) in immunocompetent preclinical models. In conclusion, the field of virotherapy is becoming mature in its knowledge of effective anticancer mechanisms in animal tumor models with OVs that are also safe in human clinical trials. It seems that there may soon be a first-in-humans OV approved for use in the United States, which will further stimulate laboratory and clinical endeavors with this therapeutic strategy. Oncolytic viruses: a new class of immunotherapy drugs. Oncolytic viruses represent a new class of therapeutic agents that promote anti-tumour responses through a dual mechanism of action that is dependent on selective tumour cell killing and the induction of systemic anti-tumour immunity. The molecular and cellular mechanisms of action are not fully elucidated but are likely to depend on viral replication within transformed cells, induction of primary cell death, interaction with tumour cell antiviral elements and initiation of innate and adaptive anti-tumour immunity. A variety of native and genetically modified viruses have been developed as oncolytic agents, and the approval of the first oncolytic virus by the US Food and Drug Administration (FDA) is anticipated in the near future. This Review provides a comprehensive overview of the basic biology supporting oncolytic viruses as cancer therapeutic agents, describes oncolytic viruses in advanced clinical trials and discusses the unique challenges in the development of oncolytic viruses as a new class of drugs for the treatment of cancer. Nat Rev Drug Discov. 2015 Sep;14(9):642-62. http://dx.doi.org:/10.1038/nrd4663. viruses (oHSVs) are moving into the spotlight due to recent encouraging clinical trial data. Since the emergence of Zika virus (ZIKV), reports of microcephaly have increased significantly in Brazil; however, causality between the viral epidemic and malformations in fetal brains needs further confirmation. Here, we examine the effects of ZIKV infection in human neural stem cells growing as neurospheres and brain organoids. Using immunocytochemistry and electron microscopy, we show that ZIKV targets human brain cells, reducing their viability and growth as neurospheres and brain organoids. These results suggest that ZIKV abrogates neurogenesis during human brain development. Primary microcephaly is a severe brain malformation characterized by the reduction of the head circumference. Patients display a heterogeneous range of brain impairments, compromising motor, visual, hearing and cognitive functions (1). Microcephaly is associated with decreased neuronal production as a consequence of proliferative defects and death of cortical progenitor cells (2). During pregnancy, the primary etiology of microcephaly varies from genetic mutations to external insults. The so-called TORCHS factors (Toxoplasmosis, Rubella, Cytomegalovirus, Herpes virus, Syphilis) are the main congenital infections that compromise brain development in utero (3). The increase in the rate of microcephaly in Brazil has been associated with the recent outbreak of Zika virus (ZIKV) (4, 5), a flavivirus that is transmitted by mosquitoes (6) and sexually (7–9). So far, ZIKV has been described in the placenta and amniotic fluid of microcephalic fetuses (10–13), and in the blood of microcephalic newborns (11, 14). ZIKV had also been detected within the brain of a microcephalic fetus (13, 14), and recently, there is direct evidence that ZIKV is able to infect and cause death of neural stem cells (15). Here, we used human induced pluripotent stem (iPS) cells cultured as neural stem cells (NSC), neurospheres and brain organoids to explore the consequences of ZIKV infection during neurogenesis and growth with 3D culture models. Human iPS-derived NSCs were exposed to ZIKV (MOI 0.25 to 0.0025). After 24 hours, ZIKV was detected in NSCs (Fig. 1, A to D), when viral envelope protein was shown in 10.10% (MOI 0.025) and 21.7% (MOI 0.25) of cells exposed to ZIKV (Fig. 1E). Viral RNA was also detected in the supernatant of infected NSCs (MOI 0.0025) by qRT-PCR (Fig. 1F), supporting productive infection. Fig. 1ZIKV infects human neural stem cells. Confocal microscopy images of iPS-derived NSCs double stained for (A) ZIKV in the cytoplasm, and (B) SOX2 in nuclei, one day after virus infection. (C) DAPI staining, (D) merged channels show perinuclear localization of ZIKV. Bar = 100 μm. (E) Percentage of ZIKV infected SOX2 positive cells (MOI 0.25 and 0.025). (F) RT-PCR analysis of ZIKV RNA extracted from supernatants of mock and ZIKV-infected neurospheres (MOI 0.0025) after 3 DIV, showing amplification only in infected cells. RNA was extracted, qPCR performed and virus production normalized to 12h post-infection controls. Data presented as mean ± SEM, n=5, Student’s t test, *p < 0.05, **p < 0.01. To investigate the effects of ZIKV during neural differentiation, mock- and ZIKV-infected NSCs were cultured as neurospheres. After 3 days in vitro, mock NSCs generated round neurospheres. However, ZIKV-infected NSCs generated neurospheres with morphological abnormalities and cell detachment (Fig. 2B). After 6 days in vitro (DIV), hundreds of neurospheres grew under mock conditions (Fig. 2, C and E). Strikingly, in ZIKV-infected NSCs (MOI 2.5 to 0.025) only a few neurospheres survived (Fig. 2, D and E). Fig. 2ZIKV alters morphology and halts the growth of human neurospheres. (A) Control neurosphere displays spherical morphology after 3 DIV. (B) Infected neurosphere showed morphological abnormalities and cell detachment after 3 DIV. (C) Culture well-plate containing hundreds of mock neurospheres after 6 DIV. (D) ZIKV-infected well-plate (MOI 2.5-0.025) containing few neurospheres after 6 DIV. Bar = 250 μm in (A) and (B), and 1 cm in (C) and (D). (E) Quantification of the number of neurospheres in different MOI. Data presented as mean ± SEM, n=3, Student’s t test, ***p < 0.01. Mock neurospheres presented expected ultrastructural morphology of nucleus and mitochondria (Fig. 3A). ZIKV-infected neurospheres revealed the presence of viral particles, similarly to those observed in murine glial and neuronal cells (16). ZIKV was bound to the membranes and observed in mitochondria and vesicles of cells within infected neurospheres (Fig. 3, B and F, arrows). Apoptotic nuclei, a hallmark of cell death, were observed in all ZIKV-infected neurospheres analyzed (Fig. 3B). Of note, ZIKV-infected cells in neurospheres presented smooth membrane structures (SMS) (Fig. 3, B and F), similarly to those previously described in other cell types infected with dengue virus (17). These results suggest that ZIKV induces cell death in human neural stem cells and thus impairs the formation of neurospheres. Fig. 3ZIKV induces death in human neurospheres. Ultrastructure of mock- and ZIKV-infected neurospheres after 6 days in vitro. (A) Mock-infected neurosphere showing cell processes and organelles, (B) ZIKV-infected neurosphere shows pyknotic nucleus, swollen mitochondria, smooth membrane structures and viral envelopes (arrow). Arrows point viral envelopes on cell surface (C), inside mitochondria (D), endoplasmic reticulum (E) and close to smooth membrane structures (F). Bar = 1 μm in (A) and (B) and 0.2 μm in (C) to (F). m = mitochondria; n = nucleus; sms = smooth membrane structures. To further investigate the impact of ZIKV infection during neurogenesis, human iPS-derived brain organoids (18) were exposed with ZIKV, and followed for 11 days in vitro (Fig. 4). The growth rate of 12 individual organoids (6 per condition) was measured during this period (Fig. 4, A and D). As a result of ZIKV infection, the average growth area of ZIKV-exposed organoids was reduced by 40% when compared to brain organoids under mock conditions (0.624 mm2 ± 0.064 ZIKV-exposed organoids versus 1.051 mm2 ± 0.1084 mock-infected organoids normalized, Fig. 4E). Fig. 4ZIKV reduces the growth rate of human brain organoids. 35 days old brain organoids were infected with (A) MOCK and (B) ZIKV for 11 days in vitro. ZIKV-infected brain organoids show reduction in growth compared with MOCK. Arrows point to detached cells. Organoid area was measured before and after 11 days exposure with (C) MOCK and (D) ZIKV in vitro. Plotted quantification represent the growth rate. (E) Quantification of the average of mock- and ZIKV-infected organoid area 11 days after infection in vitro. Data presented as mean ± SEM, n=6, Student’s ttest, *p < 0.05. In addition to MOCK infection, we used dengue virus 2 (DENV2), a flavivirus with genetic similarities to ZIKV (11, 19), as an additional control group. One day after viral exposure, DENV2 infected human NSCs with a similar rate as ZIKV (fig. S1, A and B). However, after 3 days in vitro, there was no increase in caspase 3/7 mediated cell death induced by DENV2 with the same 0.025 MOI adopted for ZIKV infection (fig. S1, C and D). On the other hand, ZIKV induced caspase 3/7 mediated cell death in NSCs, similarly to the results described by Tang and colleagues (15). After 6 days in vitro, there is a significant difference in cell viability between ZIKV-exposed NSCs compared to DENV2-exposed NSCs (fig. S1, E and F). In addition, neurospheres exposed to DENV2 display a round morphology such as uninfected neurospheres after 6 days in vitro (fig. S1G). Finally, there was no reduction of growth in brain organoids exposed to DENV2 for 11 days compared to MOCK (1.023 mm2 ± 0.1308 DENV2-infected organoids versus 1.011 mm2 ± 0.2471 mock-infected organoids normalized, fig. S1, H and I). These results suggest that the deleterious consequences of ZIKV infection in human NSCs, neurospheres and brain organoids are not a general feature of the flavivirus family. Neurospheres and brain organoids are complementary models to study embryonic brain development in vitro (20, 21). While neurospheres present the very early characteristics of neurogenesis, brain organoids recapitulate the orchestrated cellular and molecular early events comparable to the first trimester fetal neocortex, including gene expression and cortical layering (18, 22). Our results demonstrate that ZIKV induces cell death in human iPS-derived neural stem cells, disrupts the formation of neurospheres and reduces the growth of organoids (fig. S2), indicating that ZIKV infection in models that mimics the first trimester of brain development may result in severe damage. Other studies are necessary to further characterize the consequences of ZIKV infection during different stages of fetal development. Cell death impairing brain enlargement, calcification and microcephaly is well described in congenital infections with TORCHS (3, 23, 24). Our results, together with recent reports showing brain calcification in microcephalic fetuses and newborns infected with ZIKV (10, 14) reinforce the growing body of evidence connecting congenital ZIKV outbreak to the increased number of reports of brain malformations in Brazil. Scientists report that the Zika virus may be associated with an autoimmune disorder that attacks the brain’s myelin similar to multiple sclerosis (MS). The investigators will discuss the results of their research at the upcoming American Academy of Neurology’s 68th Annual Meeting in Vancouver, Canada. For the study, researchers followed people who came to the hospital in Recife from December 2014 to June 2015 with symptoms compatible with arboviruses, the family of viruses that includes Zika, dengue, and chikungunya. Six people then developed neurologic symptoms that were consistent with autoimmune disorders and underwent exams and blood tests. The authors saw 151 cases with neurological manifestations during a period of December 2014 to December 2015. All of the people came to the hospital with fever followed by a rash. Some also had severe itching, muscle and joint pain, and red eyes. The neurologic symptoms started right away for some people and up to 15 days later for others. Of the six people who had neurologic problems, two of the people developed acute disseminated encephalomyelitis (ADEM), a swelling of the brain and spinal cord that attacks the myelin. In both cases, brain scans showed signs of damage to the brain’s white matter. Unlike MS, ADEM usually consists of a single attack that most people recover from within 6 months. In some cases, the disease can reoccur. Four of the people developed Guillain-Barré syndrome (GBS), a syndrome that involves myelin of the peripheral nervous system and has a previously reported association with the Zika virus. When they were discharged from the hospital, five of the six people still had problems with motor functioning. One person had vision problems and one had problems with memory and thinking skills. Tests showed that the participants all had Zika virus. Tests for dengue and chikungunya were negative. Team at Purdue becomes the first to determine the structure of the Zika virus, which reveals insights critical to the development of effective antiviral treatments and vaccines. Any regions within the virus structure unique to Zika have the potential to explain differences in how a virus is transmitted and how it manifests as a disease, said Richard Kuhn, director of the Purdue Institute for Inflammation, Immunology and Infectious Diseases (PI4D) who led the research team with Michael Rossmann, Purdue’s Hanley Distinguished Professor of Biological Sciences. The team’s paper marks the first published success of the new Purdue Institute for Inflammation, Immunology and Infectious Diseases in Purdue’s Discovery Park. The university’s recently announced $250 million investment in the life sciences funded the purchase of advanced equipment that allowed the team to do in a couple of months what otherwise would have taken years, Rossmann said. Stretches of DNA altered by the human immunodeficiency virus (HIV) can be targeted by the CRISPR/Cas9 endonuclease system, resulting in strategically placed cuts, imperfect repairs to those cuts, and—finally—the end of viral replication. But in some cases, the battle-scarred DNA that CRISPR/Cas9 leaves behind won’t give up the fight. Worse, this DNA becomes harder to recognize, by dint of its scars, and becomes even more dangerous. It acquires a form of resistance, the ability to duck renewed attacks from CRISPR/Cas9. This finding emerged from a study carried out by an international team of scientists that represented McGill University, the University of Montreal, the Chinese Academy of Medical Sciences, and Peking Union Medical College. These scientists, led by McGill’s Chen Liang, Ph.D., found that when CRISPR/Cas9 is used to mutate HIV-1 within cellular DNA, two outcomes are possible: (1) inactivation of HIV-1 and (2) acceleration of viral escape. This finding, the researchers cautioned, potentially limits the use of CRISPR/Cas9 in HIV-1 therapy. The researchers also sounded an optimistic note. They pointed to strategies that could help overcome HIV’s tendency to escape CRISPR/Cas9’s antiviral action. For example, targeting multiple sites with CRISPR/Cas9 or using other enzymes aside from Cas9. Once a solution is identified, the next barrier will be identifying ways to deliver the treatment to patients. The research team’s work appeared April 7 in the journal Cell Reports, in an article entitled, “CRISPR/Cas9-Derived Mutations Both Inhibit HIV-1 Replication and Accelerate Viral Escape.” The article emphasized the importance of the CRISPR/Cas9 system’s reliance on single guide RNA (sgRNA), the programmable element of the system that allows DNA to be cleaved at specific sequences. The authors added that indels that are compatible with viral viability should be taken into consideration if Cas9/sgRNA is used to treat virus infection and genetic diseases. They expect that such indels would contribute to virus escape not only when Cas9/sgRNA is utilized to control new infections, but also in the context of eliminating latent viral DNA of herpes viruses, hepatitis B virus (HBV), and HIV, among others. To investigate whether HIV-1 is able to escape from Cas9/sgRNA-mediated inhibition, we first generated CD4+ SupT1 cell lines that stably expressed both Cas9 and sgRNA that we previously showed could inhibit HIV-1 production in transient transfection experiments (Zhu et al., 2015). These Cas9 and sgRNA genes were stably transduced into SupT1 cells using a lentiviral vector (Sanjana et al., 2014). These Cas9/sgRNA-expressing cells showed growth capacity similar to that of the control cells (Figure S1A). The T4 sgRNA targets the overlapping open reading frames (ORFs) of HIV-1 gag/pol genes, while T10 targets the overlapping ORFs of HIV-1 env/rev genes (Figure 1A). Both viral targets are very conserved in HIV-1 sequences that are registered in the HIV database (Figure S1B). Since each of these two sgRNAs targets two specific viral genes, we conjectured that the genetic barrier should be high for HIV-1 to mutate and escape from inhibition. A control SupT1 cell line expressed Cas9 only. We first tested these SupT1 cell lines by exposing them to the NL4-3 HIV-1 strain for a short term of infection. The results showed that T4 or T10 sgRNA together with Cas9 reduced the number of HIV-1 infected cells (Figure 1B) and diminished the production of infectious viruses (Figure 1C). To demonstrate that these reductions had resulted from the action of Cas9/sgRNA that causes indels, we extracted total cellular DNA from the infected cells, amplified the viral DNA region that was targeted by the T4 or T10 sgRNA, cloned the PCR products, and sequenced the DNA clones. Although no mutations were detected in the targeted viral DNA that was extracted from the infected control SupT1 cells, rich arrays of indels were identified in viral DNA from the infected SupT1 cells that expressed T4 or T10 sgRNA (Figures 1D and 1E). The percentages of indels for the T4 and T10 sgRNAs were approximately 25% and 30%, respectively. We also tested a number of these indels by inserting them into the HIV-1 DNA and observed that the majority of them abolished the production of infectious viruses in addition to the two substitution mutations that produced as much infectious viruses as the wild-type viral DNA did (Figure S1C). In addition to the NL4-3 HIV-1 strain, we further tested the T4 sgRNA against two primary HIV-1 isolates 89.6 and YU-2, as well as three transmitted founder viruses CH040, CH077, and CH106. The results showed that Cas9/T4 sgRNA caused indels in these viral DNA and strongly inhibited the production of each of these latter viruses (Figures S1D and S1E). Together, these results confirm that Cas9/sgRNA inhibits HIV-1 infection by introducing various mutations into viral DNA. We next performed HIV-1 evolution experiments and monitored viral growth over prolonged times by measuring viral reverse transcriptase (RT) activity in culture supernatants. The results showed that HIV-1 replication was delayed in SupT1 cells expressing T4 or T10 sgRNA compared to viral replication in control SupT1 cells (Figure 2A). Nonetheless, viral production eventually peaked in the T4 and T10 SupT1 cells, showing that HIV-1 had escaped from suppression by Cas9/sgRNA. To further demonstrate viral escape, we collected viruses at the peaks of viral RT levels in the control, T4, and T10 cells, and then utilized the same RT levels of each virus to infect the corresponding SupT1 cell line. The T4 and T10 viruses displayed even moderately faster replication kinetics than the control virus in this second round of replication (Figure 2B), which suggests that the escape viruses might have gained mutations that improve viral infectivity. CRISPR/Cas9 gene editing has shown remarkable therapeutic potential, including the ability to fightpathogens like HIV. But the same process that inactivates the deadly virus may also enable it to escape the treatment, according to research led byChen Liang of McGill University in Montreal, published today (April 7) in Cell Reports. The findings essentially replicate those of another group, led by Atze Das of the Center for Infection and Immunity Amsterdam. The Das team’s findings appeared last month (February 16) in Molecular Therapy. “We both demonstrated HIV-1 can be inhibited by the CRISPR/Cas system, and [that] the virus can escape,” Das, who was not involved in the new research, told The Scientist. He said the similarity of the studies was a coincidence. A number of previous studies have demonstrated that CRISPR/Cas9 can be used to prevent HIV from replicating, but there wasn’t much evidence that the virus could escape that repression. For the present study, Liang and colleagues used single guide RNAs (sgRNAs) and the Cas9 enzyme to target and snip out HIV-1 DNA from the genome of human T cells in vitro. When Cas9 cuts the DNA, the cell repairs it using a process called nonhomologous end joining. This process is prone to errors, resulting in insertion and deletion mutations, or indels. By culturing cells with CRISPR-modified HIV, the researchers showed that these indels are lethal for the virus—they reduce the number of infected cells, and produce fewer infectious viruses. However, some of the mutations were minor enough that the virus was able to escape and infect other cells. When the researchers cloned and sequenced the DNA from the escaped virus, they expected to see mutations throughout the DNA. “But we found that the mutations were all clustered at one site—where the Cas9 enzyme cleaves the viral DNA,” Liang told The Scientist. As a result, the sgRNA could no longer recognize the viral sequence, rendering it immune to future CRISPR attack. The study provides “experimental evidence to show the existence of HIV viral escape for single guide RNA/Cas9,” neurovirologist Wenhui Hu of Temple University who was not involved in the work told The Scientist in an email, “although it was predicted and the proof of concept had been proposed or tested,” he added. Liang’s team is now working on ways to address the problem. One method the authors suggest—demonstrated by Hu’s team and other groups—is to target the viral DNA using multiple guide RNAs, which increases the chances of disabling the virus. 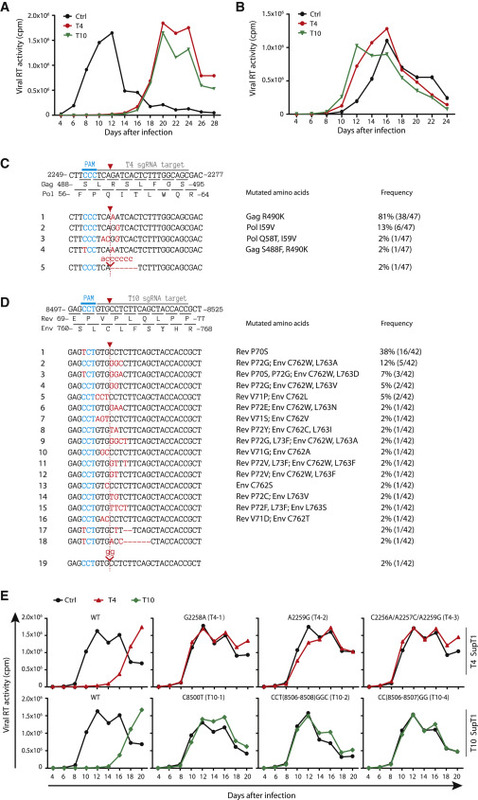 We have shown that the indels generated by Cas9/sgRNA confer resistance against Cas9/sgRNA. Following recognition of PAM by Cas9, the adjacent target DNA unwinds and initially binds to the first 10-nt seed sequence of sgRNA (Jiang et al., 2015). Cas9 then cleaves the target DNA at a position three nucleotides away from PAM. The NHEJ machinery is then recruited to the double-stranded DNA break. While repairing this DNA lesion, NHEJ often introduces insertion or deletion mutations (Hsu et al., 2014). These indels result in a change in the target DNA sequence, thus preventing sgRNA from binding and leading to resistance to Cas9/sgRNA. If the sgRNA targets a viral DNA sequence that is not essential for viral replication, then the indels that are generated should quickly lead to the emergence of Cas9/sgRNA-resistant, replication-competent viruses, as we observed with the LTR-B sgRNA (Figure 4D). When essential viral genes are targeted by sgRNA, the resistance-conferring indels should contribute to viral escape if they minimally affect the functions of the targeted viral genes. These latter indels should maintain the ORFs of viral genes and lead to only minimal changes in numbers of amino acids (one or two). The results of our MiSeq experiments reveal that these types of indels do exist in transiently infected cells as well as in the escape viruses (Figures 4B and 4C). Results of our study do not exclude the possibility that, when cells contain two or more copies of proviral DNA, homologous repair may contribute to the generation of escape mutations. Our findings are corroborated by a recent report showing HIV-1 escapes from Cas9/sgRNA inhibition by mutating the sgRNA target sequence (Wang et al., 2016). The indels that are compatible with viral viability should be taken into consideration if Cas9/sgRNA is used to treat virus infection and genetic diseases. We expect that such indels would contribute to virus escape not only when Cas9/sgRNA is utilized to control new infections, but also in the context of eliminating latent viral DNA of herpes viruses, HBV, and HIV, among others. This is because introduction of a viable indel into latent viral DNA should lead to the mutated viral DNA being resistant to Cas9/sgRNA, but still able to produce infectious viruses upon activation. One potential solution might be to simultaneously target two or multiple sites in the viral genome with an array of sgRNAs in the way that multiple siRNAs have been used to durably suppress HIV-1 replication (Schopman et al., 2010). Several recent studies demonstrated that the clustered regularly interspaced short palindromic repeats (CRISPR)-associated endonuclease Cas9 can be used for guide RNA (gRNA)-directed, sequence-specific cleavage of HIV proviral DNA in infected cells. We here demonstrate profound inhibition of HIV-1 replication by harnessing T cells with Cas9 and antiviral gRNAs. However, the virus rapidly and consistently escaped from this inhibition. Sequencing of the HIV-1 escape variants revealed nucleotide insertions, deletions, and substitutions around the Cas9/gRNA cleavage site that are typical for DNA repair by the nonhomologous end-joining pathway. 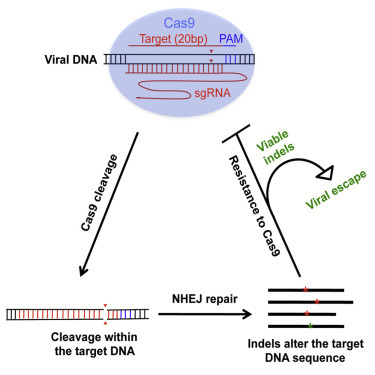 We thus demonstrate the potency of CRISPR-Cas9 as an antiviral approach, but any therapeutic strategy should consider the viral escape implications. Several studies demonstrated that the Cas9/gRNA system can be used for inhibition of human pathogenic DNA viruses, including hepatitis B virus,3,4,5,6,7,8 Epstein–Barr virus,9 and human papilloma virus.10 Replication of retroviruses, like HIV-1, can also be inhibited with the Cas9/gRNA system by targeting the reverse-transcribed HIV-1 DNA replication intermediate or the proviral DNA upon integration into the cellular genome.2,11,12,13 Gene therapy approaches for the treatment of HIV-1 infected individuals have been proposed in which the Cas9 and antiviral gRNAs are directed to HIV-1 infected cells to inactivate or delete the integrated provirus, or in which blood stem cells are harnessed against new infections. However, Cas9/gRNA-mediated inhibition of virus production and/or replication has been shown only in short-term experiments, while we know that HIV-1 can escape from most if not all types of inhibitors, including small molecule antiviral drugs and sequence-specific attack by RNA interference. We therefore set out to identify viral escape strategies from Cas9/gRNA-mediated inhibition. In silico algorithms were used to select 19 gRNAs that should target HIV-1 DNA with high efficiency and exhibit no off-target effects on cellular DNA (see Supplementary Table S1). Seven gRNAs were selected that target the long terminal repeat (LTR) region present at the 5′ and 3′ ends of the proviral genome (Figure 1a). Five of these (gLTR1–5) also target the accessory nef gene that overlaps the 3′ LTR, but that is not essential for in vitrovirus replication. Twelve gRNAs target sequences that encode other viral proteins, including well-conserved domains in the essential gag, pol and env genes and sequences of overlapping reading frames, like the tat and rev genes (Figure 1a). Nine selected gRNAs target sequences that are highly conserved among different HIV-1 isolates (Shannon entropy <0.2; gLTR7, gGag1, gGagPol, gPol1–4, gTatRev, and gEnv2), while the other gRNAs target less conserved HIV-1 domains (Shannon entropy ≥0.20; gLTR1–6, gGag2, gVpr, gEnv1, and gNef). Cas9/gRNA targeting of the HIV-1 genome. (a) The HIV-1 proviral DNA with the position of gRNAs tested in this study. (b) The efficiency of gRNAs to silence HIV-1 DNA was tested in 293T cells transfected with plasmids expressing Cas9, gRNA, and HIV-1 LAI. To quantify viral gene expression, the viral capsid protein (CA-p24) was measured in the culture supernatant at 2 days after transfection. Average values (±SD) of four experiments are shown. Statistical analysis (independent samples’ t-test analysis) demonstrated that CA-p24 expression in the presence of antiviral gRNAs differed significantly from values measured with control gRNAs against luciferase and GFP (*P < 0.05). We first tested the antiviral activity in transient transfections of 293T cells with plasmids expressing HIV-1, Cas9 and one of the anti-HIV gRNAs or control gRNAs targeting non-HIV sequences (luciferase, GFP). To quantify HIV-1 gene expression, we measured viral capsid protein (CA-p24) produced at 2 days after transfection (Figure 1b). A similar high CA-p24 level was observed when different control gRNAs were tested, but this level was significantly reduced for all anti-HIV gRNAs, which is likely due to Cas9/gRNA induced cleavage of the HIV-1 plasmid. Accordingly, the inhibitory effect was not observed in control experiments with only Cas9 or gRNA (data not shown). There may be some small differences in antiviral activity among the gRNAs, but we decided to move all inhibitors forward to antiviral tests in stably transduced T cells. SupT1 T cells were first transduced with a Cas9-expressing lentiviral vector. Stably transduced cells were selected and subsequently transduced with a lentiviral vector expressing one of the antiviral gRNAs. Of note, none of the selected gRNAs target the lentiviral vectors. Upon infection of transduced cells with the HIV-1 LAI isolate, virus replication was monitored by measuring the CA-p24 level in the culture supernatant. Efficient virus replication was apparent in control nontransduced SupT1 cells and in Cas9-only transduced cells, as reflected by a rapid increase in the CA-p24 level (Figure 2a) and the appearance of large virus-induced syncytia and cell death around day 10 after infection (Figure 2b; average time of HIV-1 breakthrough replication of four experiments are shown). HIV-1 replication in cells transduced with Cas9 and gRNAs targeting poorly conserved LTR sequences (gLTR1–6) was only marginally delayed (Figure 2a and data not shown) and breakthrough replication resulting in large syncytia was observed at 12–14 days (Figure 2b). Replication in cells transduced with Cas9 and gLTR7, which targets the highly conserved and essential TATA-box region of the LTR promoter, was more delayed and resulted in breakthrough replication at 19 days. A similar split was observed when targeting protein-coding regions. 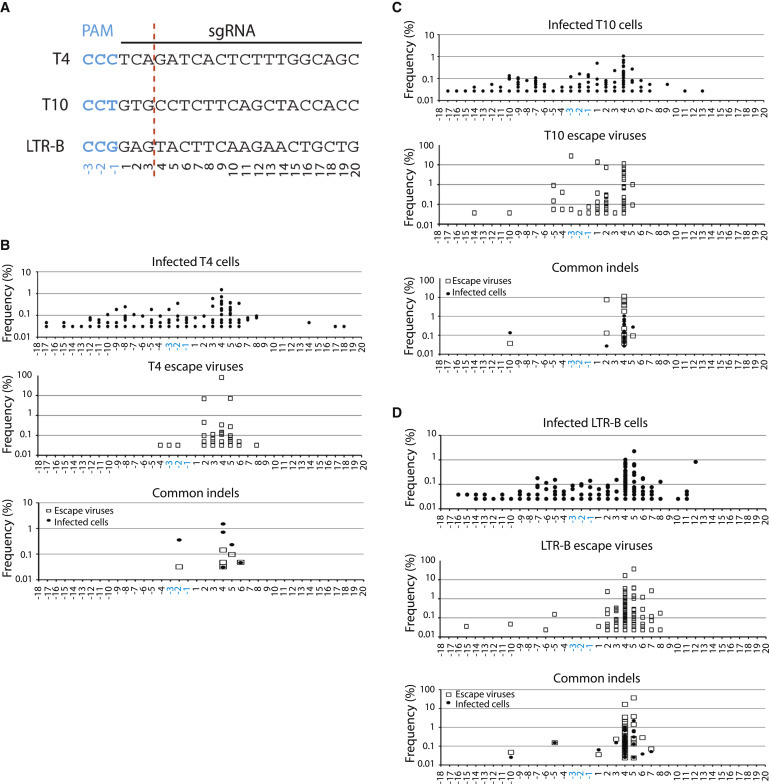 Targeting highly conserved HIV-1 sequences (gGag1, gGagPol, gPol1–4, gTatRev, and gEnv2) exhibits a more sustained antiviral effect (breakthrough replication in 20–43 days; Figure 2b) than targeting less conserved domains (gGag2, gVpr, gEnv1, and gNef; breakthrough replication in 11–17 days; Figure 2b). Surprisingly, despite their potency to suppress virus production (Figure 1b), some of the gRNAs inhibited virus replication only briefly and none prevented breakthrough virus replication. Moreover, the time required for breakthrough replication did not correlate with the potency of inhibiting HIV-1 production in 293T cells (see Supplementary Figure S1). HIV-1 replication in Cas9 and gRNA expressing cells. (a,b) SupT1 cells stably transduced with Cas9 and gRNA expressing lentiviral vectors were infected with HIV-1 LAI. Virus replication was monitored by measuring the CA-p24 level in the culture supernatant (a) and by scoring the formation of virus-induced syncytia (b). The day at which massive syncytia were observed, which reflects breakthrough virus replication, is indicated. Average values of four experiments (±SD) are shown. SupT1, control nontransduced cells. SupT1-Cas9, cells transduced only with the Cas9 expressing vector. (c) Correlation between the level of inhibition (day of breakthrough replication; as shown in b and the conservation of target sequence amongst different HIV-1 isolates (Shannon entropy as shown in Supplementary Table S1). The Pearson’s correlation coefficient was calculated: r = −0.58. We first tested whether the breakthrough viruses were indeed resistant to the specific Cas9/gRNA set by passage onto fresh matching Cas9/gRNA SupT1 cells and control nontransduced cells. The breakthrough viruses replicated with similar efficiency on both cell lines (see Supplementary Figure S2), which confirmed the escape phenotype. Both cell lines were also infected with wild-type HIV-1 LAI, showing the selective replication block in restricted Cas9/gRNA cells. As a powerful technology for genome engineering, the CRISPR/Cas system has been successfully applied to modify the genomes of various species. The purpose of this study was to evaluate the technology and establish principles for the introduction of precise genetic modifications in early human embryos. Methods 3PN zygotes were injected with Cas9 messenger RNA (mRNA) (100 ng/μl) and guide RNA (gRNA) (50 ng/μl). For oligo-injections, donor oligo-1 (99 bp) or oligo-2 (99 bp) (100 ng/μl) or dsDonor (1 kb) was mixed with Cas9 mRNA (100 ng/μl) and gRNA (50 ng/μl) and injected into the embryos. Results By co-injecting Cas9 mRNA, gRNAs, and donor DNA, we successfully introduced the naturally occurring CCR5Δ32 allele into early human 3PN embryos. In the embryos containing the engineered CCR5Δ32 allele, however, the other alleles at the same locus could not be fully controlled because they either remained wild type or contained indel mutations. Conclusions This work has implications for the development of therapeutic treatments of genetic disorders, and it demonstrates that significant technical issues remain to be addressed. We advocate preventing any application of genome editing on the human germline until after a rigorous and thorough evaluation and discussion are undertaken by the global research and ethics communities.